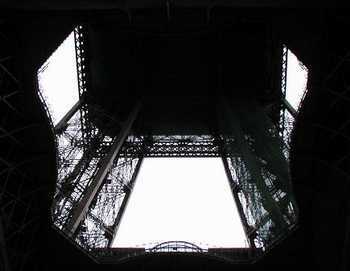 View from underneath the Eiffel Tower. Here we are, in an island of Oui surrounded by a sea of Non. The French voted Non on ratification of the EU constitution on Sunday, and it has thrown the EU into a state of confusion and uncertainty. The vote was overwhelming, especially geographically. The Ile de France, a small group of departments (like counties) in the upper middle of the country, is where Paris is located, and where much of the country’s population is concentrated. 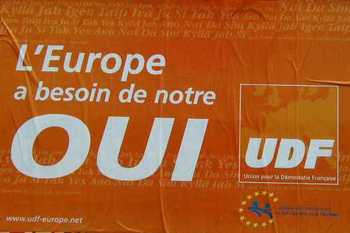 The majority in the Ile de France voted Oui. However, out of the total 90-some departments in France, 80-some voted Non. So the Ile is an island in more ways than one. A few other departments voted Oui. One is in Alsace, bordering Germany. Germany has already ratified the EU constitution, but I think they did it with a parliamentary vote, not a general referendum by the voting public. Another area that voted Oui was the Loire valley, where rich people live. The vote was divided mainly along socioeconomic lines, not party lines. In fact, the outcome threatens to split the Socialist party in a fatal way. Within Paris’s 20 arrondissements, the poorest (the 18th, 19th, and 20th ) ones are where the Ouis won by the smallest margin. Where we sit, in the 15th, 72 percent voted Oui and 28 percent voted Non. In the richest arrondissments, the 7th and the 16th, the Ouis won with 80 percent of the vote. Voter turnout was 66 percent in Paris (like Sanibel’s 67 percent in March). 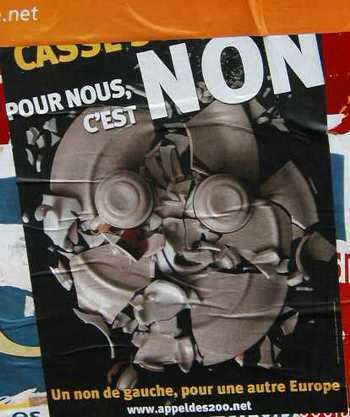 Overall, 55 percent of the French voters said NON. Paris is indeed different from the rest of France. 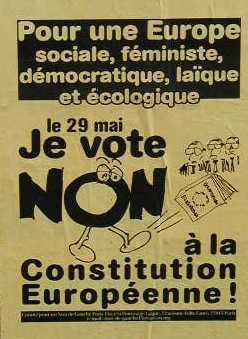 I think Chirac made the right moral choice, sending the vote to the people rather than having Parliament ratify the constitution, which it surely would have done. But I don’t think Chirac made his choice on moral grounds. He simply made a drastically wrong political decision. Rather than accepting responsibility, he is expected to fire the prime minister, Raffarin, and appoint a replacement. Unemployment has been high in France for some time. It is at a 5-year high of 10.2 percent now. I’ve sensed the malaise of the French regarding their economic security, and I’ve wondered why the euro could possibly have become so strong. Well, now the evidence of that malaise has been made quite clear and the euro is falling. Today it is at a 7-month low. The Netherlands votes on the EU constitution tomorrow. I think they, too, will vote No. Then what happens, I wonder? A French newspaper had a very good column by Vincent Tournier which was translated and included in the International Herald Tribune. I hope it made it into the New York Times for Americans to read. 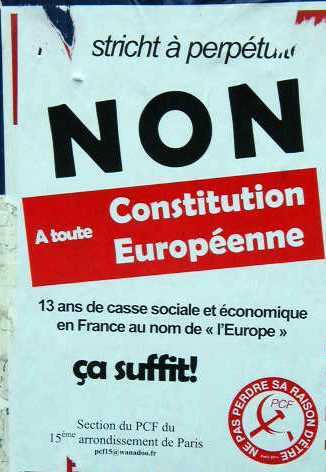 It was about how many have tried to claim that the EU constitution is like the US constitution. However, the columnist claims, this is simply not true. Size is one factor: the amazing US constitution, which forms the basis for our strong democracy, is only a few pages long. 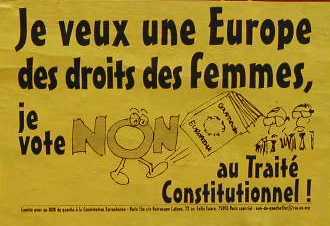 The proposed EU constitution is 450 pages long, written mostly by a longtime French bureaucrat and politician, Valery Giscard d’Estaing. The 25 European states are very different from each other. They don’t share a common language. They include some wildly different cultures that are very old and steeped in revered tradition. The 13 original US colonies had much more common ground. Including having to fend off the Brits. The only way an EU constitution would have a hope is if it went a long way toward preserving as much in the way of states rights as possible. However, at 450 pages of structure and requirements, it does not appear (to the voters) to do that. The columnist also says that the complicated text of the EU constitution is also a problem. Its Bill of Rights is nowhere near as readable as the US Bill of Rights.